February 1, 2016 – Rockford, Illinois – GDS, Inc. (Global Display Solutions), a world leader in display technology for outdoor digital signage, has won a QSR Magazine’s Applied Technology Award. 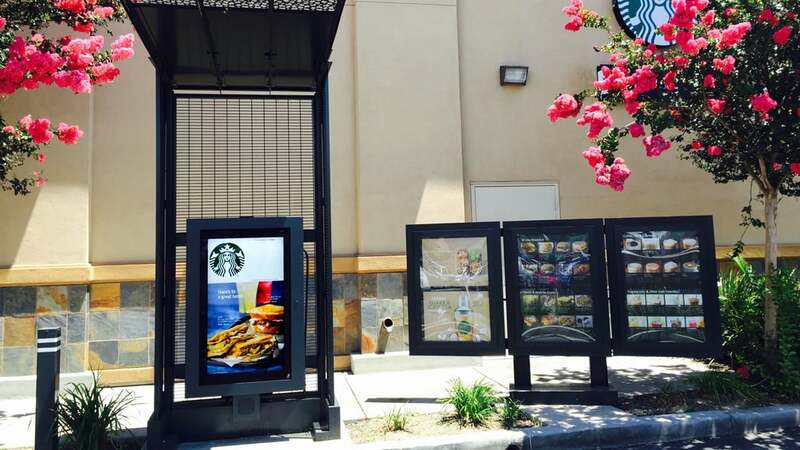 The accolade for customer facing technology is for the largest installation of large format QSR outdoor digital displays which are currently being rolled out at all Starbucks drive-thru locations in the U.S. The 46” LCD screens create camera to camera interaction similar to FaceTime® resulting in an improved barista / customer connection. The majority of QSR sales are derived from the drive-thru lane and Starbucks recognized the need to bring the barista to the customer’s car through the use of digital technology. There were two main challenges. The first was posed by the outdoor environment requiring a display that could withstand extreme heat without the noise and interference of an air conditioner while protecting against rain, dust, cold and snow. The second challenge was to improve customer satisfaction by the creation of face time with the barista. To drive increased loyalty, Starbucks needed to re-vamp the ‘old school’ signage in the drive-thru. 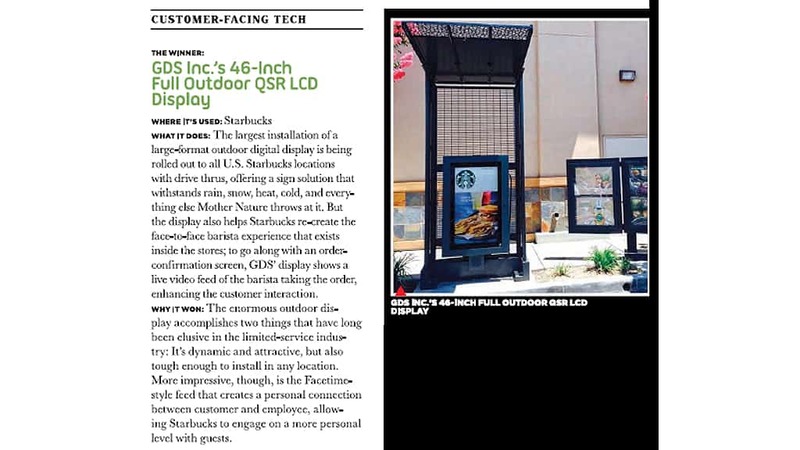 GDS was chosen by Starbucks due to its proven field operation and front-of-screen performance. The sunlight readable, full outdoor LCD displays with an integrated camera and microphone are being deployed in the Starbucks drive-thru lanes and are designed and manufactured to withstand the worst of Mother Nature. Replicating the in-store experience through technology, a live video feed of the barista coupled with order confirmation and advertising on one screen maximizes utilization of these digital screens, increases customer interaction and improves efficiency. GDS MIDAS QSR outdoor displays are designed to operate efficiently under full sunlight conditions without the adverse effects of solar loading on the LCD panel. MIDAS QSR is designed to operate 24/7 and includes a built-in diagnostic system to monitor the operational performance of the display. The GDS LCD displays are designed and manufactured to withstand the rigors of rain, snow, heat, cold, dust and extreme temperature ranges. They feature optical bonding, thermal management, and remote diagnostics to monitor the display from a central location and are engineered so customers with polarized sunglasses can easily read the screen.